Last updated on December 27th, 2018. 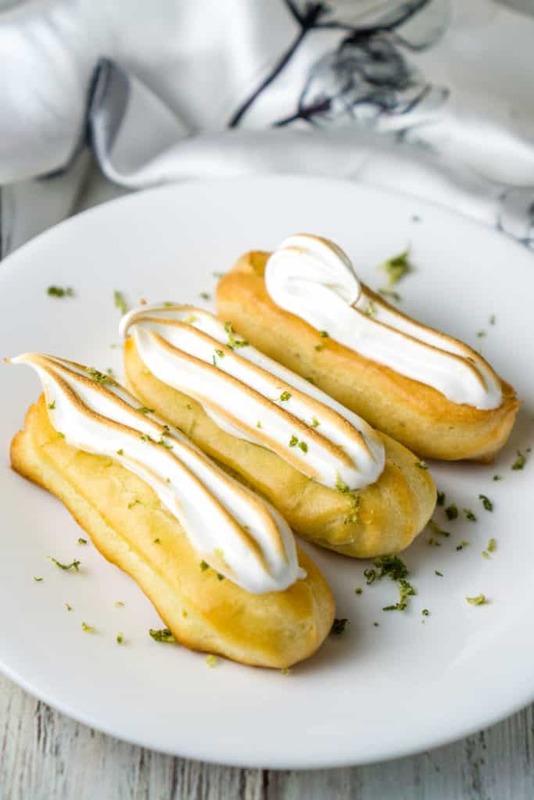 These Mini Eclairs with Lime Custard and Meringue Topping are half the size but ALL the flavor! The zesty lime custard filling is perfectly balanced by the sweet, light meringue topping. These two-bite sized eclairs are definitely an easy to make yet impressive dessert to serve at a dinner party. Bet you can’t have just one! Hey everyone! This is the 200th recipe on this blog! And what better way to celebrate this milestone than by posting a delicious dessert recipe? 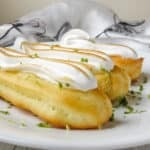 These Lime Meringue Eclairs are just the thing! They are small 2-3 inch mini eclairs that are just perfect for eating in two bites. Each mini eclair is filled with a delicious lime custard filling that is not too sweet and not too tart. And each eclair is topped with a light and fluffy meringue. The combination of flavors is irresistible, and these mini eclairs are super addicting. They are elegant, light, fluffy, and so tasty. I got this eclair recipe from Ateliers & Saveurs, where we took a class on how to make eclairs while we were in Montreal (read about it here!). I am not much of a baker, but these eclairs turn out AWESOME every time. This means that the recipe is pretty foolproof. In the eclair class we made huge full-sized eclairs, but at home I wanted to make mini eclairs just to have a little bit of portion control. The best part about making mini eclairs instead of full-sized ones? They don’t have to be perfect! Even if you are not the best dessert decorator (ahem, that’s me), these come out super cute even if there are some imperfect meringue swirls! In the eclair class, we made four different kinds of eclairs. 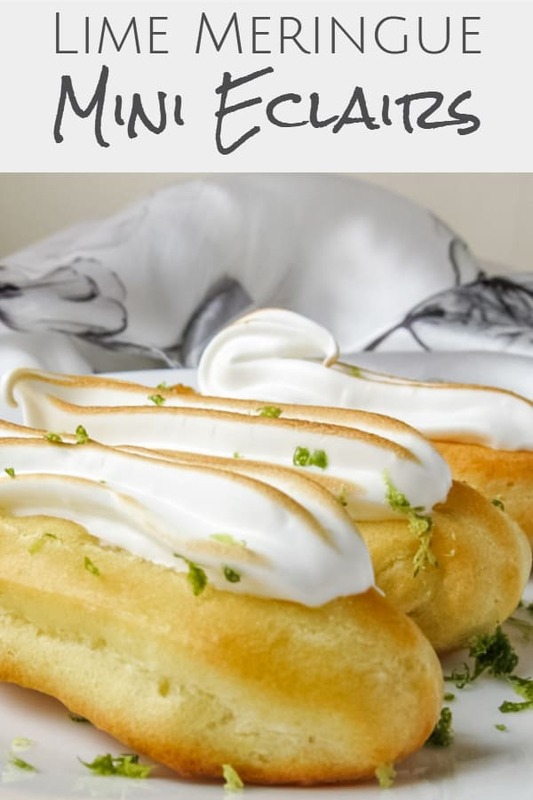 These lime meringue eclairs were my favorite out of the four flavors – I loved how the citrusy lime custard paired with the fluffy, sweet meringue. Every bite of these was amazing! 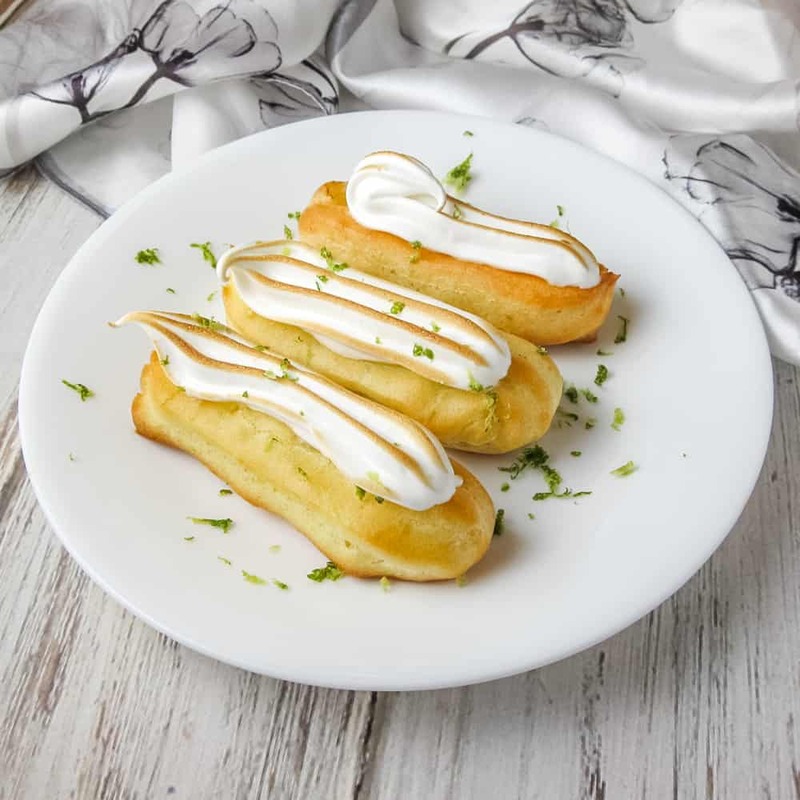 The mini eclairs are actually quite easy to make, since you can think of this recipe as three separate parts: the dough, the lime custard, and the meringue. Each of the three parts is actually a very simple recipe. You’ll prepare the eclair dough on the stove top with the usual: milk, water, sugar, vanilla, butter, and flour. Then stir in five eggs until they are fully incorporated. The eggs are what makes the eclair dough puff up nicely while baking. You’ll make the lime custard filling on the stove-top as well. The custard will need to cool thoroughly before you can use it to fill the eclairs, so I recommend making the filling first and letting it cool in the fridge. The meringue topping is a simple meringue with egg whites and confectionery sugar made with a stand mixer (or a hand-mixer, if that’s what you got). 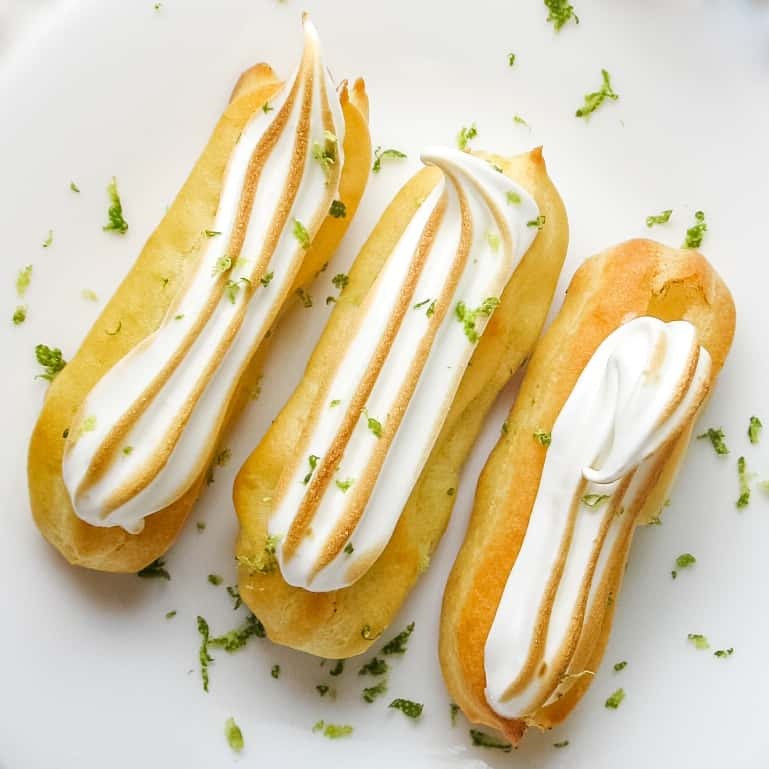 To assemble the eclairs, you’ll cut off the tops of each baked eclair to make a little “boat” or “canoe.” Fill the eclair boats with lime custard and use a piping tip to add the meringue topping. This recipe is in grams instead of cups/tablespoons which might seem overwhelming. But don’t worry! Using weights is actually the most accurate way to bake and it’s quite easy. You’ll just need a kitchen scale. Place a bowl on the kitchen scale and hit the “tare” button. Add your first ingredient. Then tare the scale again and add the second ingredient. Keep going just like that until you’ve added all the ingredients – super easy. Baking with a kitchen scale actually makes for much less dirty dishes, since you’re not getting a million measuring cups and spoons dirty. Use fresh lime juice for this recipe! The flavor of fresh lime juice cannot be compared to the bottled stuff. This citrus squeezer makes it easy to squeeze a bunch of limes. Don’t skip the lime zest. It adds a nice aromatic element to these eclairs and it only takes a few seconds to make lime zest from fresh limes. Make sure you zest the limes before juicing them. This zester is actually kind of fun to use. Don’t be afraid to use a culinary torch. It’s fun! It’s what adds those nice brown lines to the meringue topping by caramelizing the sugars in the meringue. 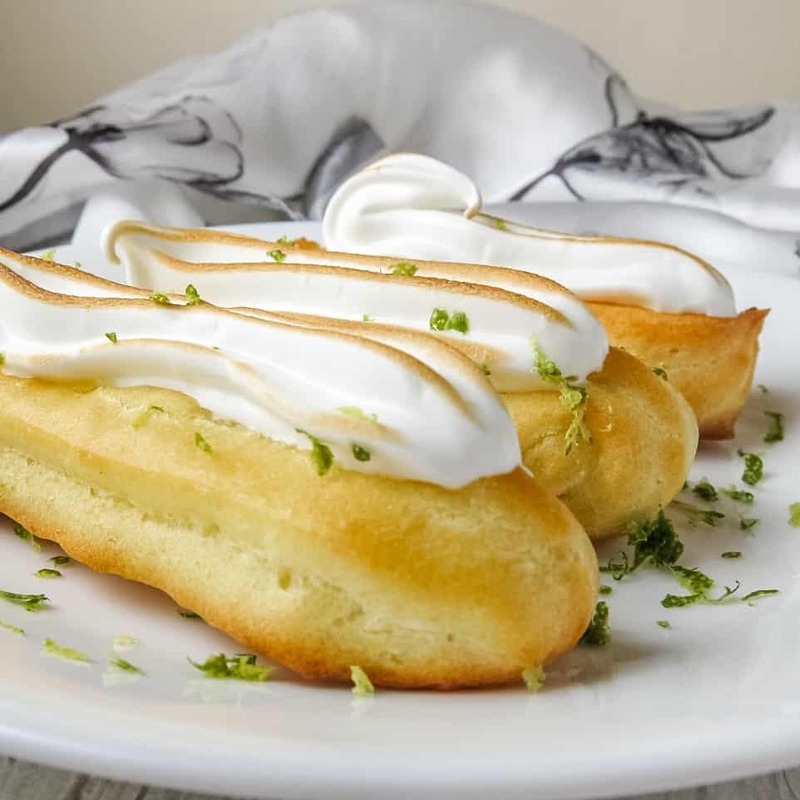 These Lime Meringue Mini Eclairs are half the size but ALL the flavor! The zesty lime custard filling is perfectly balanced by the sweet, light meringue topping. These two-bite sized eclairs are definitely an easy to make yet impressive dessert to serve at a dinner party. In a large pot, combine the water, milk, sugar, salt, butter, and vanilla and bring to a boil. Lower the heat, add the flour, stir with a wooden spoon. Continue to cook and stir until the dough stops sticking to the edge of the pan. Remove from heat and add the eggs one at a time, using a wooden spoon to stir. Make sure each egg is fully mixed and incorporated into the dough before adding the next one. Line a large baking sheet with parchment paper. Fill a pastry bag or zip lock bag with a piping tip (any wide tip will do!) with the dough and pipe dough into 3-inch logs about 3/4 inch thick. Place in the oven and immediately lower the heat to 365F. Bake for 25 minutes, or until the eclairs puff up, turn golden brown, and sound hollow when tapped. Remove from oven. Once the eclairs cool, use a knife to cut off the tops to make a canoe-shaped eclair. These eclairs will be filled with the lime custard. In a medium pot, add all the ingredients except for the butter. Bring to a boil, mixing constantly. Allow to boil for at least 30 seconds. Add the butter, mix until melted, and remove from heat. Place in the refrigerator to cool and thicken. To speed up the cooling, you can pour the the lime custard into a shallow baking tray. Add egg whites to a glass or metal mixing bowl. Use a stand mixer or a hand mixer to beat the eggs whites on medium until they start to foam. Slowly sift in the sugar and continue beating constantly until stiff peaks form. The meringue is done when you can flip the bowl upside down and the meringue does not pour out. Place the cooled lime custard into a piping bag or zip lock bag (no decorative piping tip is necessary). Fill the eclairs with lime custard. Place the meringue into another piping bag with a decorative tip and top the eclairs with meringue. If desired, use a culinary torch to brown the meringue and sprinkle with lime zest. Congrats on your 200th post- you’re ahead of me- I only have about 110 posts so far! I’ve heard of eclairs filled with custard and topped with chocolate icing, but not meringue- what a novel idea! Thanks! Yea this was a new one for me too, but turned out to be my favorite out of 4 types of eclairs we made in the class, including *gasp* the chocolate icing one! OK, I’m trying to comment on your insta, but it’s not working so I came here to see more of these peeeerf eclairs! Look soooo cute! !